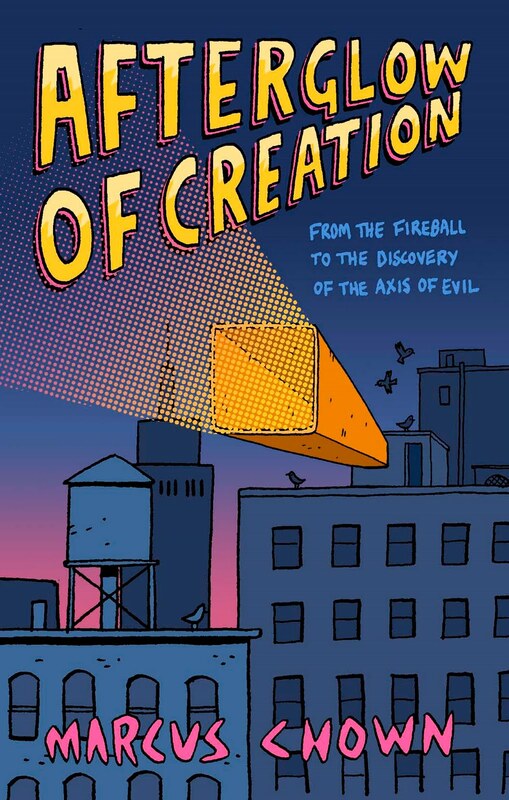 The Afterglow of Creation by Marcus Chown (published by Faber) was originally published in 1993 and has now been re-released for your reading pleasure. In his easy to understand style, Marcus tells the story of the people involved in the discovery of the afterglow of the Big Bang with added material to reflect the most recent developments. Click here to read the press release. The forward of this book is filled with the richly textured layers of memories that Marcus has of his father. The anecdotes are guaranteed to bring a lump to your throat and tears to your eyes, so don’t read the foreword in a public place like I did. If you want to be entered in the draw for a free copy of The Afterglow of Creation all you have to do is describe your best memory of a family member in the comment box below and an entry will be chosen randomly from all the entries on Monday evening and posted here Tuesday. You can also leave any questions that you may have for Marcus in the comment box and he’ll do his best to answer them. I’ll start you off with a favourite memory about my Grammie Kirkby. Her favourite saying is “Many hands make light work”. For a few years I lived on the street behind her house and I spent many happy hours working alongside her picking veg from the garden or fruit from the tress. She taught me how to make pasty, dill pickles, chutney’s jams and many other home preserves. The days were long and the kitchen was hot but the time passed in happy haze filled with conversation and laughter. I adore my grandmother and treasure every memory I have of her. Not being able to spend time with her is one of the things I miss most about not living in Canada any more. What a lovely memory of your grandmother. (wax a saw with the stub of a candle to stop it sticking). from a wooden crate and straw. That was very moving. Was that your grandmother? I loved spending time with my grandmothers and learned so much from them. I don't think I'll ever stop missing them. My favorite memory of my dad is when he took me to one of his astrophysics conferences in London, when I was only 14. I only agreed to go because he told me Brian May out of Queen would be there, but that part didn't even turn out to be that interesting. I loved this conference because, when I saw my dad give his presentation on black holes (or something similarly confusing to a 14-year-old), it was the first time I realised that he was a really smart guy, and I have aspired to be a physicist just like him ever since. They do have a special place in family life. Welcome. What an awesome memory to have, thanks for sharing it. So many to choose from. My father was old and had become miserable with Parkinson's Disease. I took him from Derbyshire to The Royal Opera House, Covent Garden, a trip I was not looking forward to – except that Placido Domingo was the star in Turandot, one of my favourite operas. We went to the dress rehearsal as I thought at least I'd be able to take Daddy to the loo, etc, without too much fuss. Arriving outside the stage door, Daddy tired, miserable and in a wheelchair, someone said 'That's Reg Barker', whisked him away down the back corridoors with me running behind. Suffice it to say, Daddy was treated like a star, our tickets ignored as we were put at the front with the press! The conducter, Colin Davies, came and spoke to him at the break and by the end of the day, I remembered what a wonderful man and musician with an exceptional talent Daddy was. The day kept Daddy going for weeks afterwards – he loved it. I can remember every detail right now. He was one of the best timpani and percussionists of all time. That's a beautiful memory DJ. Some of my earliest memories are of my grandfather as he taught me how to play chess. The first time I beat him (and not because he let me) the look of pride mixed with disbelief on his face was amazing. My favourite memory is of my Dad. I was really ill with tonsilitus and was confined to bed. My Dad sat down next to me and brough out the book 'The Hobbit'…he read the entire thing to me over a number of nights. He had different voices for every character and it was during that time that I fell in love with reading and books…I've not looked back since!! Since you started with your grandmother – my grandmother had been suffering from small strokes and cancer but at the time was still able to get around and get out of the house. Her neighbor had arrived to take her somewhere, shopping maybe. My grandmother, sitting in her easy chair, tried to reach for her purse and found herself unable to use that side of her body. Her neighbor called out in alarm something like, "Oh my God Claire! You're having another stroke! You can't move your arm! Oh my God!" My grandmother shot her a severe look and said gravely and calmly, "There is nothing wrong with my arm. My purse is on the wrong side." Rags (my dad) was a "don't pee on my leg and tell me it's raining" kind of guy. Although he was really a kind man, his voice rang terror in all ten of us little Brouillettes' hearts, all thinking, "don't let it be me, don't let it be me" who was in trouble. "ROSEMARY, GET UP! YOU'RE SCARING THE HELL OUT OF YOUR MOTHER!!!!" POP! My eyes open immediately. A voice that could wake the dead!!!! My parents were quite old when I was born (45 & 53) so I have vague memories of my grandparents. However one that stands out in my mind is of my grandmother (from Glasgow) pouring out half the bottle of my grandfather's (from Aberdeen) Scotch and refilling it with tea. He did like his Scotch. He would complain bitterly that the trip to America was bad for Scotch and that it tasted different from what he'd get in Scotland. He never knew about the tea! That's an incredible story, it made me smile. What a great night it must have been for both of you. I'm so glad he didn't let you win on purpose. Isn't it amazing what we remember from our childhoods? Your dad is almost as wonderful as mine 🙂 I think they would like each other very much. I'm not sure I understand. had she had a stroke just then and was calm about it? Or was her bag really on the wrong side? She sounds like one cool cookie whichever it was. That is a superb story. What a powerful man. I bet you were scaring him a lot with your refusal to wake from the anaethetic too and not just your mom! How is it that he never noticed the tea in his Scotch? I guess it must have been a very peaty single malt. I'm old enough to have accumulated many wonderful memories …. but I think my favorite are of my father who passed away when I was only 16. His death was shocking and quick ~ he was ill for only three days. BUT … my Daddy was so bright, so creative, so funny. He could play virtually any musical instrument placed in front of him with the exception of my flute ~ which he NEVER figured out how to play. He could fly planes, do trick photography, make me tap shoes using soda bottle caps, refurbish old bicycles. I will never forget one Halloween night when I was out trick-or-treating …. he put an old white sheet over his body and scared the ##*%% out of us! We had no idea it was him. He was the father who would pile me and my friends into our ancient car and take us any place we needed to be. He was the father that couldn't attend any of my flute competitions because he was so nervous for me … but when I brought home my 1st and 1st Superior medals, he was my biggest fan. I miss him still … he's been gone for 52 years. Great story of your Grammie. I could feel the warmth of the kitchen. My grandma could never eat anything with her false teeth in, up to and including Christmas dinner with all the family. As a result, by the time she'd finished scooping up the last of the brussels and picking the final morsels from her turkey bones, it would be…the following Christmas. Fortunately, she passed away before the time-space continuum was torn apart by a Christmas feast of an indeterminate vintage. Plus, it was great the year when my dog ran off with the top set just before we lit the pud. Thanks for dropping by my blog to let me know about your great giveaway! I've got so many family memories… 99 per cent of them positive. I was very lucky! One of the bad ones, though, is my mum telling me and my brother off after we drove our bikes through the tar. What can I say, it looked so tempting! Bye bye bikes! Great post and some very moving memories here. My Grandma was the person I loved most in the world when I was growing up. I spent half of my time living with her and I have such different memories of her to all of her sons and daughters (she had 8) and other grandchildren. I was her eldest grandchild and we definitely had a special bond. We both loved to read and from about 8-11 years old I used to share her bed and we'd read a book together. The one I remember most is 'Little Women' which I devoured and had to wait impatiently for her to finish the page so we could turn over to the next one. Sitting out in the sun in the Summer too always takes me back to the days when we'd sit in her back garden reading all day, taking breaks only for her to get us an american cream soda icecream float. Later in life,when she was diagnosed with diabetes, she wasn't supposed to eat chocolate but hid boxes of Dairy Box under her bed which she'd get out for her and I to share when no-one else was around. She was always mischevious. She put it down to having to 'survive' in the orphanage she grew up in, in Dublin. She used to like telling me the stories of her life in the orphanage, like the time she got caught by the nuns after stealing apples and hiding them in her knickers. She never told the sad tales though. My grandma died of cancer at 60, only six months after I left home to go to university. I took time out and spent a fair few overnights studying Shakespeare (sounds corny but it is true) whilst sitting by her hospital bedside. It was such a huge loss to all of our family, not least my mother who has never gotten over it. But she definitely left some great memories. When thinking of my childhood, there are few moments I remember without her in them. Ah you see you've made me all nostalgic. But this is a lovely post – thanks! Your father sounds as if he was incredibly talented but more importantly he was a 'proper' dad and very involved with you and your siblings. What horrible thing killed him so quickly? Thank you. I have a wonderful HUGE family and I miss them lots, esp when I read stories of your family get togethers on your blog during the holdiay periods. Your poor grandmother. You do know that she's waiting to kick your arse for saying nasty things about Bambi on your last blog post though? You drove your bike through tar? Children do the funniest things. I once found some paint and spread it all over the inside of a public building, der. I'm still waiting to get in trouble for that. Welcome and as for your story, wow. I feel quite moved. How lucky you were to have such a wonderful woman in your life.I agree that grandchildren wuite often have totally different memories of their grandparents than their parents do, my family is the same though both my granmothers are well loved. I think granchildren hold special places in their grandparents hearts as they do in ours. I know not everyone feels this way about their grandparents and I feel so sorry for them. The bit about her sneaking chocolate made me alugh, a chocolate dependant diabetic. Bless her. So pleased that you liked the Foreword to "Afterglow of Creation" about my dad, and that it has triggered all these childhood memories from everyone! My memories are filled with my childhood spend with my grandmother, her sitting with my sister and I at the table, she taught us to eat all sort of fruits and vegetables and have fun while eating them, and for that I will always be grateful – she is the reason I cannot but eat healthy now. wow, thanks for the wonderful memories you've provoked Marcus and to Denyse for hosting this draw. I've loved reading all of these. Loved reading all your memories. The winner – taken at random from a hat – is Wilochre with your grandmother's false teeth (stolen by the dog). Congratulations! Hope you enjoy "Afterglow of Creation" and hope it doesn't bring you to tears, as it did Denyse! All I need is an address so that my publisher, Faber & Faber can mail you a copy of the book. Thanks to everyone. And thanks, in particular, to Denyse for your generosity.